To actually understand what assessments do and don’t do. Many organizations have implemented or plan to introduce 360-degree feedback as an assessment tool in their organization. The 360-degree feedback is a system or process in which an employee or multiple employees receive confidential, anonymous feedback from people who work with them (peers), directly for them (direct reports) and supervise them (boss). They are, in fact, very powerful development tools when used appropriately. When used with the wrong intentions or with little understanding of the 360-degree instrument, they can have the potential for disaster. To single-out the “problem” employee. Using a 360 instrument in this manner creates a perception that multi-rater feedback is only for poor performers. Or, it can be used as ammunition to weed out poor performers. As the single instrument for performance evaluations. This is especially true if your company’s performance appraisal is tied to compensation decisions. An employee’s development plan can certainly be shared between the two systems. However experience shows that the formal 360-degree feedback should be utilized independently if it is to be viewed as a developmental process, and not perceived as having a direct financial impact. Clearly, when a leader improves performance as a result of feedback and focus on new skills or behaviors, the changes should be recognizable and reflected in the individual’s performance review. In an organization where trust and open communication is absent. If open communication and honest feedback is not valued or desired within the organization- this type of instrument will prove useless. Participants and management need to be involved and gain a full understanding of the goals and purpose of the tool. Providing 360 feedback will not, by itself, solve the problems of a poorly functioning company. 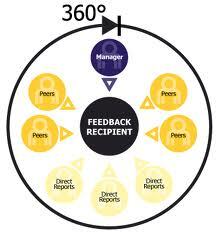 It should also be noted that by design, 360 degree feedback reflects subjective feedback. While it gives a much more rounded view of a person (vs. just a boss / self review), by its very nature, 360 feedback is based on the rater’s PERCEPTION of a person’s behaviors and skills. While perception tends to reflect one’s reality, it does not always accurately reflect the person’s intentions. What system(s) is best for your organization? Tell us about your experience using 360-degree instruments or receiving a 360-degree feedback?